Proprietary constituents in STS Foliar Activator reduce surface tension and enhance foliar absorption. This is achieved by using organic surfactants and proprietary low molecular weight complexing and chelating agents that stop the electro-magnetic attraction between elements with positive and negative charges. STS Foliar Activator delivers a complete and balanced micronutrient package, for optimum turf response. STS Foliar Activator contains our Nutrient Mining Technology™, Solu-Plus, along with proprietary natural plant and fermentation extracts, Solu-Kelp, Yucca extract, antioxidants, glycosides, nitrogen and potassium. 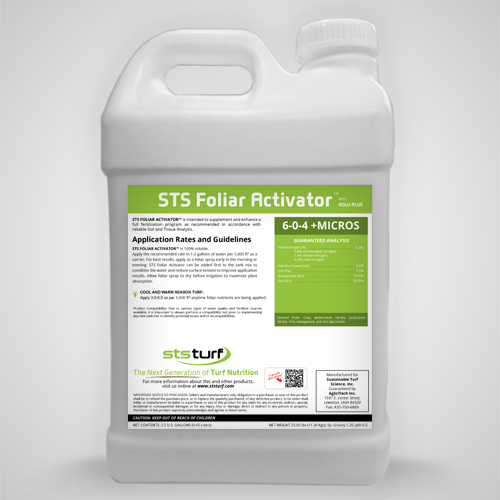 STS Foliar Activator also contains a comprehensive micronutrient package chelated with amino and organic acids. Due to its rich concentration of organic compounds, STS Foliar Activator not only optimizes nutrient absorption, it also enhances buffering potential when using poor quality irrigation water.